Purpose. The purpose of research is to determine the possibility of using of infrasound measurements that carried out in Ukraine for verification of registered seismic events and using of infrasound method as one of the criteria for their identification. Methodology. Registration of seismic and infrasonic signals carried out with using of geophysical networks of Main Center of Special Monitoring (MCSM). To register infrasound the small aperture acoustic group systems are used, allowing directional monitoring of events. Processing of seismic signals was carried out using standard procedures adopted in seismology to determine the parameters of the signal source. To handle infrasonic signals method of multi-progressive correlation is used. The assignment of seismic and infrasonic signals to one phenomenon was based on estimated by seismic data source parameters, propagation time of infrasonic waves from it, azimuth to the source and form of infrasonic signals. In case of registration of infrasonic signals by two acoustic groups, the coordinates and time at source compared with data of seismic monitoring. Results. The data on the parameters of 699 seismic events from mining explosions that took place in August 2014 - March 2015 in Ukraine were received. 124 infrasonic response of these events were registered. The limits of sensitivity and range of using of infrasound method for this type of event were determined. The possibility of using of two or more acoustic groups for location of signal source where seismic data is not enough to evaluate its options was described. The difference in the form of infrasound signals from mining explosion and earthquake was determined. Originality On the basis of existing facilities MCSM propose new technology of registering signals from seismic events by seismic-acoustic complex that allows you to record ground industrial explosions at a distance of 200 kilometers, identified characteristics of the main sources of perturbations that allow classification of these disturbances. Practical significance. Infrasound observations together with seismic enable to identify the event, and in some cases further define the parameters of the source. Using these infrasonic measurements in near real mode allows you to use this method for environmental monitoring, rapid assessment of the events that took place, the provision of information in case of emergencies (explosive depots, pipelines, etc.) for rapid response services. In future it is planned to evaluate energy developments by infrasound method to define the features of infrasound propagation, determine the frequency response of seismic and infrasonic signals. 1. Asming V. E., Yevtyugina Z. A., Vinogradov YU. A., Fedorov A. V. Analiz infrazvukovykh signalov, generiruyemykh tekhnogennymi istochnikami [Analysis of infrasound signals generated by anthropogenic sources] // Vestnik MGTU [Bulletin of MSTU], 2009, T. 12, no. 2, pp. 300–307 (in Russian). 2. Borisenko L. S., Safronov O. N., Pustovitenko B.G. Seysmogennyye zony platformennoy chasti Ukrainy i Azovo-Chernomorskogo regiona [Seismogenic zone of the platform part of Ukraine and Azov-Black Sea region]. 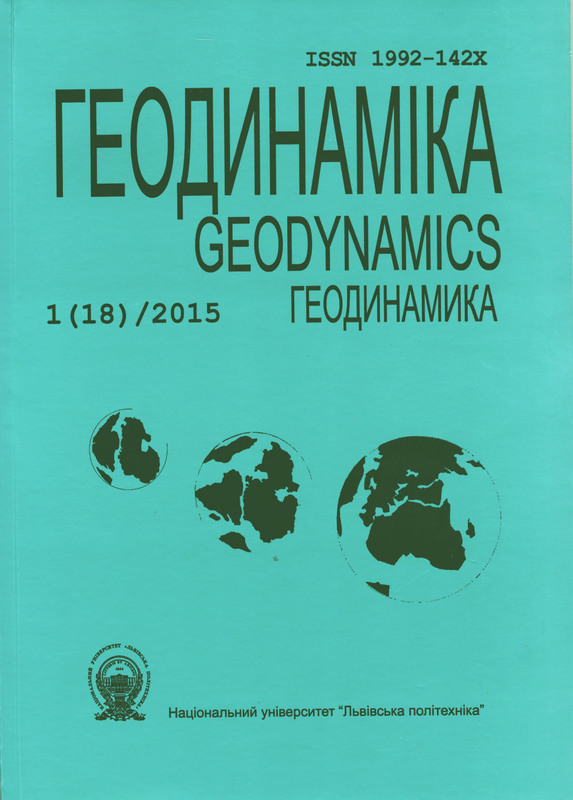 Geodinamika i seysmoprognosticheskiye issledovaniya na Ukraine [Geodynamics and seismic prognostic studies in Ukraine]. Kyiv, Nauk.dumka [Scientific thought Publ. ], 1992, pp. 31–41(in Russian). 3. Dubrovin V. I., Smirnov A. A. Sovmestnoye ispol'zovaniye infrazvukovykh i seysmicheskikh dannykh dlya povysheniya tochnosti lokalizatsii [Sharing infrasound and seismic data to improve the accuracy of localization] / Bulletin NNC RK, 2011, issue 3, pp.140–144. 4. Gordiyenko Y. A., Karyagin Y. V., Lyashchuk O. I., Solonets A. I. Postroyeniye sistem akusticheskogo gruppirovaniya dlya realizatsii infrazvukovogo monitoringa [Design and construction of acoustic grouping for the implementation of infrasound monitoring] Kharkiv:KHUPS. Sistemi obrobki ínformatsii [Information processing system], 2006. issue 3 (52). pp. 36–42 (in Russian). 5. Liashchuk O. I., Karyagin Ye. V. Ispol'zovaniye sistem gruppirovaniya akusticheskogo metoda dlya obnaruzheniya tekhnogennykh zvukovykh istochnikov. [Using acoustic-array systems for the detection of anthropogenic sound sources] Zhitomir, Materiali XV naukovo-tekhnichnoí̈ konferentsii "Naukovi problemi rozrobki, modernízatsii ta zastosuvannya ínformatsíyno-vimíryuval'nikh sistem kosmíchnogo i nazemnogo bazuvannya" [Materials XV scientific and technical conference "Scientific problems of development, modernization and use of information computing space and ground-based"], 2006a. p. 85 (in Russian). 6. Liashchuk O. I. Primeneniye infrazvukovykh i elektromagnitnykh metodov dlya monitoringa zemletryaseniy regiona Vrancha [The use of infrasound and electromagnetic methods to monitor earthquakes in the Vrancea region] Geodinamíka [Geodynamics], 2011, no. 2(11), pp. 178–180 (in Russian). 7. Liashchuk O. I., Karyahin Ye. V., Kachalin I. H. Rezultaty doslidzhen infrazvukovykh yavyshch na ukrayinskiy antarktychniy stantsiyi Akademik Vernadskiy [The results of studies the effects of infrasound on Vernadsky Ukrainian Antarctic station]. Kyiv, Materialy III Mizhnarodnoyi naukovoyi konferentsiyi "Naukovi doslidzhennya v Antarktytsi" [Proceedings of III International Conference Research in Antarctica], 2006 b. p. 50 (in Ukrainian). 8. Sashchuk I. N., Strinada V. V., Kachalin I. G., Lyashchuk O. I., Karyagin Ye. V. Ispol'zovaniye maloaperturnoy akusticheskoy gruppy v sostave Mezhdunarodnoy sistemy monitoringa. [ Using a small aperture acoustic group of the International Monitoring System] Zhitomir, Zbírnik naukovikh prats' [Collection of scientific papers] ZHVI NAU. 2010, issue 4, pp.115–122 (in Russian). 9. Rybachuk O. I., Kyrylyuk V. A., Strinada V. V., Lyashchuk O. I., Klivets S. I. Metodyka rozpiznavannya dzherel zburen v blyzhniy zoni pry vykorystanni akustychnoyi systemy heofizychnoho monitorynhu [Method of recognizing sources of disturbances in the near field using geophysical monitoring acoustic system]. Kharkiv: KHUPS, Systemy Obrobky informatsiyi [Information processing systems]. 2008, issue.1(68), pp. 73–77 (in Russian). 10. Kharitonov O. M. Seysmichnost' territorii Ukrainy [Seismicity in Ukraine ]. Geophysical Journal. 1996, no.1, vol. 18, pp. 3–15 (in Russian). 11. Vinogradov Yu. A. Kompleksnoye primeneniye seysmicheskogo i infrazvukovogo metodov registratsii volnovykh poley dlya vydeleniya signalov ot nazemnykh vzryvov v protsesse monitoringa prirodnoy sredy v Yevro-Arkticheskom regione [Complex application of seismic and infrasound wave fields registration methods for the isolation of signals from the ground explosions in the process of monitoring the environment in the Euro-Arctic Region] avtoreferat dis. kandidata tekhnicheskikh nauk [abstract dis. candidate of technical sciences]: 25.00.10. Moscow, 2004, In-t dinamiki geosfer RAN [Institute of geosphere dynamics RAS], 26 p. (in Russian). 12. Yevseyev S. V. Intensivnost' zemletryaseniy Ukrainy. Seysmichnost' Ukrainy [The intensity of earthquakes Ukraine. Seismicity of Ukraine]. Kyiv: Naukova dumka, 1969, 120 p. (in Russian). 13. Zolotov A. V. Problema Tungusskoy katastrofy 1908 g. [The problem of the Tunguska catastrophe in 1908] Minsk, Nauka i tekhnika [Science and Technology], 1969, 204p. (in Russian). 14. Arrowsmith, S. J., M. D. Arrowsmith, M. A. H. Hedlin, and B. W. Stump. Infrasonic Signals from Large Mining Explosions. 2008. Bulletin of the Seismological Society of America, Vol. 98, No. 2, pp. 768–777. 15. Cansi, Y. An automated seismic event processing for detection andlocation: the P.M.C.C. method. 1995. Geophys. Res. Lett. 22, pp.1021–1024. 16. Hagerty, M. T., W.-Y. Kim, and P. Martysevich. Infrasound detection of large mining blasts in Kazakhstan. 2002, Pure Appl. Geophys. 159, pp. 1063–0179. 18. Le Pichon, Alexis; Ceranna, L.; Pilger, C.; Mialle, P.; Brown, D.; Herry, P.; Brachet, N. The 2013 Russian Fireball largest ever detected by CTBTO infrasound sensors. 2013. Geoph. Res.Let. 40 (14): 3732. DOI:10.1002/grl.50619. 19. McKenna, M. H., Stump, B. W., Hayek, S., McKenna, J. R., and Stanton, T. R. Tele-infrasonic studies of hard-rock mining explosions. 2007. J.Acoust. Soc.Am.122, pp. 97–106. 20. Mutschlecner, J. P., and R. W. Whitaker. Infrasound from earthquakes. 2005. J. Geophys. Res. 110, D01108, doi 10.1029/2004JD005067. 21. Self, Stephen & Rampino, Michael R. The 1883 eruption of Krakatau. 1981. Nature 294 (5843): pp. 699–704. doi:10.1038/294699a0. 22. Steven J. Gibbons, Frode Ringdal, and Tormod Kværna. Joint seismic-infrasonic processing of recordings from a repeating source of atmospheric explosions. 2007. J. Acoust. Soc. Am. 122 (5), DOI: 10.1121/1.2784533. 23. Stump, B. W., M. A. H. Hedlin, D. C. Pearson, and V. Hsu. Characterization of mining explosions at regional distances: implications with the international monitoring system. 2002. Rev. Geophys. 40, 1011, doi 10.1029/1998RG000048. 24. Whipple FJW. The great Siberian meteor and the waves, seismic and arial, which it produced. 1930.Q J R Meteorol Soc 56:287–304. 25. Young, C., Jun, M.-S., Joen, J.-S., and Min, K. D. Analysis of local seismo-acoustic events in the Korean Peninsula 2002. Geophys. Res. Lett.29, 29-1, 10.1029/2001GL014060. 26. Zoltan A. Der, Robert H. Shumway, Eugene T. Herrin. Monitoring the Comprehensive Nuclear-Test-Ban Treaty: Data Processing and Infrasound. 2002. Springer, 278 p. DOI 10.1007/978-3-0348-8144-9.